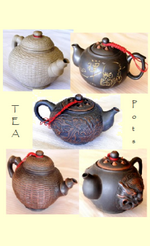 Extra small Chinese Yi Xing style clay ceramics teapot crafted in Taiwan. Chinese Mini Teapot, Yixing-style, high-grade handicraft clay pottery tea ceramics. Extra-small (150ml) Chinese teapot with perfect pouring behavious, neutral taste and aroma properties and simple and functional design. For more informationen please see the product description below. Chinese Mini Teapot, Yixing-style, high-grade handicraft clay pottery tea ceramics. Extra-small (100ml) Chinese teapot with perfect pouring behavious, neutral taste and aroma properties and art design. Chinese Yixing-style clay teapot with simple traditional pattern; high grade clay ceramics pottery from Taiwan. Clay teapot in Chinese Yixing design with carved motif; high grade tea ceramics pottery crafted in Taiwan. Teapot in Chinese Yixing style with worked-in lion motif; high grade Taiwanese clay ceramics pottery.